Give your business the order fulfillment infrastructure and expertise you need to quickly reach your customers. One of the biggest challenges eCommerce businesses face today is delivering their goods in a timely and cost-effective manner to their customers. This can be especially challenging if your business is growing rapidly or if you see a spike in demand. You can gain or lose business depending on how well you handle these challenges. However, it can be a costly investment for you to internally develop or expand these logistical capabilities on your own. A third-party logistics (3PL) provider can give your business the order fulfillment infrastructure and expertise you need to quickly reach your customers while allowing you to maintain a streamlined operation focused on your core strengths. Our fulfillment services handle all of the order logistics for your business – from the time an order is placed on your website to the point that it is received by your customer. We take the responsibility of order fulfillment and distribution so that you can concentrate on growing your business. No extended contracts or leases on warehouse space that can hurt your business over time if you commit to too much or too little. No more training employees and managing staff. We make it easy for you to sell online. Our process is simple. You ship your inventory to our warehouses to be stored. We integrate with the shopping cart that you utilize on your website to process orders, and when an order is placed, it is routed to our location. The order is analyzed by our staff, and the appropriate items are pulled from your inventory. The item is then packed in the way that you specify and shipped to the customer using the service that they choose. Additional benefits of our services include the fact that we utilize strategically located warehouses on the east coast and the west coast. This allows us to pull your customer orders from the location closest to them; therefore saving you shipping charges and getting the orders to the customer in less time than is generally quoted. Order fulfillment management involves warehousing the inventory you sell to customers and then processing the orders that are placed on your website for shipment directly to your customers. 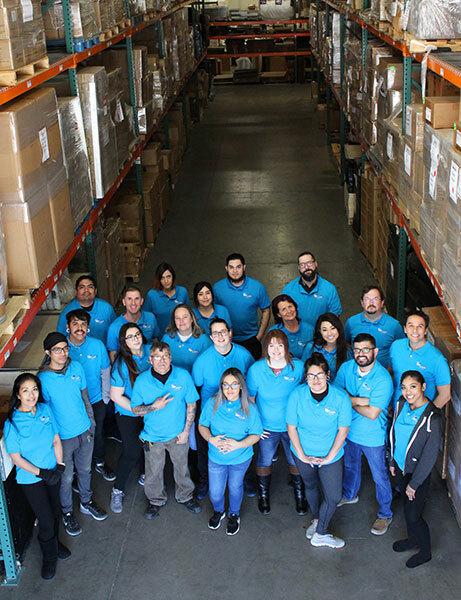 Instead of you personally managing warehouse spaces and employees, our trained staff is dedicated to the task of fulfilling your customer orders as if they were our own. Ship My Orders specializes in product fulfillment services, logistics and order shipping. When you receive the orders of your products through your eCommerce platform, our software receives that information immediately. We warehouse your inventory in our East Coast or West Coast locations, pulling the customer order from the warehouse closest to their address. Our employees professionally pick and pack the orders to your specifications, and arrange for transport and delivery to the customer. By using our fulfillment center, you can not only provide top-notch service to your customers, but you can also save money on shipping and not assume the risks of securing employees and warehouse spaces on your own. Save in overhead costs by outsourcing all your warehouse related operations. Avoid upfront expenses or risk, with Ship My Orders you are in a month to month contract, without any long-term commitments. We deal with high volume or low volume shippers, startups, seasonal companies, shipping to final consumers (B2C fulfillment) small packages or retailers (B2B fulfillment) pallets and freight shipment. We are in the business of making sure that your shipments are processed in the fastest and most efficient way and shipped in a timely manner. If you are new to online order fulfillment or curious about our procedures, please read about our daily management process below. Ship My Orders will assign a dedicated account manager to your company. Someone knowledgeable that understands your business, your merchandise, your needs, your customer needs… always willing to help you with a smile. Please contact us for a quote. Transparency: Our philosophy is to have transparency in billing and reporting. There are no hidden fees, and we give a full breakdown of all charges. Timely Fulfillment: If we receive your order by 12:00 PST, we promise to ship it that day. Communication, In-House Tech Support, & Quick Response: We have a Customer Service team that helps with any concerns you may have. Anytime an issue arises, we communicate with you so you are aware of what’s being done. Custom Features & Flexibility: We want to see your business succeed. We offer custom features to help achieve that success. Some features include kitting projects and customized programming of our software interface. Customized Reporting: Often times you may need a specific type a report to help you keep track of inventory, shipping, and/or sales. We can create reports based on your needs. Multiple Channels: We can connect to multiple shopping carts (Shopify, Magento, etc.) and/or platforms (Amazon, eBay, etc. ).